Antioxidant & Anti-Fatigue boost for the skin? We all want to look flawless with the Holidays. But this year the day from Christmas and NYE is not falling that great… So with the stress from work and prepare everything, you skin can react with looking tired. And we don’t want that! During the Holidays we want a bright, rested and firmer skin. Of course you want this result directly. So the best thing is to help your skin and give it a boost. From vichy I could try this antioxidant booster out. This booster promise that you will get a direct result and after a 10 day treatment your skin will look flawless! Mine 10 days are up now so time to tell you my experience with this booster! This booster contains powerful active ingredients, such a pure vitamin C and hyaluronic acid. So this product promises that your skin will directly look anti-fatigue and brighter. After the 10 days treatment it will work against signs of aging and will reinforce your skin radiance. But why doing a 10 days treatment? Your skin sometimes just need a boost think during stress and busy periods, with the seasonal changes,.. You can repeat this treatment whenever your skin need it! The packing is a small glass bottle with a pipette with it. I find that super easy to work with and hygiene. Also thanks to the pipette you easy can dose the drops. Bring this on, on a good cleansed skin every morning for 10 days. Place 4 to 5 drops in the palm of your hand and use your fingertips to bring this on. You let this work in for a few moments and then you can continue with your skincare routine. And don’t forget to use a SPF to protect you! I need 5 drops from this booster. But I don’t like the smell from it! It’s a weird smell, but the product itself does fantastic work so I’m not going to complain about that! 😉 When I used it the first time I indeed remarked that my skin looked much brighter. After the 10 days treatment the result was even much better than I hoped! My skin looked just fantastic! Also my pigmentation sports looked a lot lighter than before! So yes I’m so happy with that result! I have a young skin but with my skin I even saw a good result, so this one is going to work fantastic with each skin! It really gives you the boots that you need! So in short this product is just amazing! If you do the 10 days treatment it really gives your skin the boots you need! And when I notice that my skin need this, I’m going to do this treatment again. I only can recommend this liftactiv from vichy! Especially if you want a bright and fantastic skin! With the Holidays coming up is the treatment perfect to try out! But don’t forget to protect your skin with SPF! 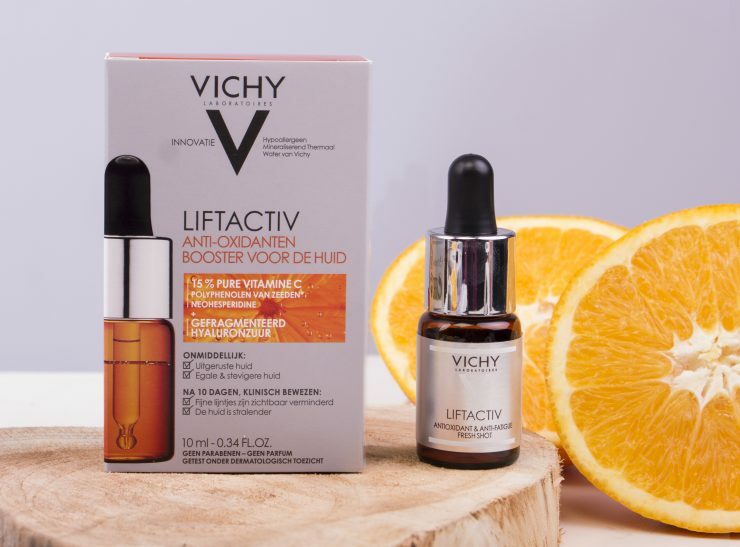 Vichy liftactiv Antioxidant & Anti-Fatigue booster contains 10ml and this is perfect for a few treatments. The price is €28,95 you can find this online or at the apothecary. Ik heb meer lovende verhalen gelezen over de VIt. C booster. Momenteel gebruik ik het van een ander merk en wat is dat goed voor je huid! Deze lijkt mij ook super! Ik ben echt fan het geef je huid echt de boots dat deze nodig heeft! Dit product wil ik graag proberen! Ik ga dit product ook uitproberen, ben erg benieuwd naar het resultaat! Ik ben deze nu aan het testen en ben eerlijk gezegd onder de indruk! Sinds ik zwanger ben, is m’n teint nogal wat grauw geworden, en ik merk dat dit echt wonderen doet voor mijn huid!